A Terrarium has two basic features. It surrounds plants completely or almost completely with glass or some other transparent material, and limits or completely restricts access to the outside air. As a result, the air within is always moister than the room atmosphere, which is similar to a tropical rain forest environment. The plants you choose depend, of course, on where you place the terrarium. If placed well away from light, it can be used to house Ferns and other green-leaved plants. When part of a window, the terrarium is an excellent home for Orchids, Bromeliads, exotic foliage plants and all mini-fl owering plants listed for bright light and moist air. Place in a bright area, but not in direct sunlight. You should have enough light to read by. When a plant gets as big as you want, pinch off the newest growth to encourage bushier growth. Water lightly once every few weeks only after it gets dry, depending on conditions. 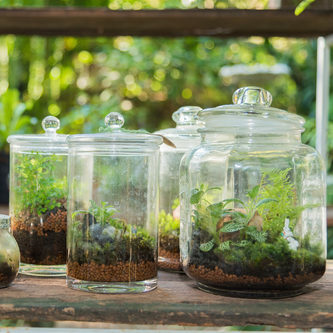 A closed terrarium can go months without watering, as it creates its own eco-system. An open container will need water once a week. NEVER OVERWATER! Do not fertilize. As the nutrients get used up the plant’s growth will slow down, helping to keep them under control. Over time the soil can be “refreshed” by scraping off the top layer of soil, and adding some fresh potting soil. This will add a small amount of nutrients, as well as freshen up its appearance. Wear gloves while planting your terrarium. Use a clean, dry glass container or bottle. Pour in a 1-2” layer of gravel (depending on the size container). Add a thin layer of charcoal (for better drainage and fi ltration), and fi nally a thicker layer or potting soil (about 2”). You can landscape the “ground” into hills and valleys. Plant your plants and remember to use a tree-like specimen and at least one trailer. Decorative moss or small grade rock can be also added on top of the soil after planting is done. Your terrarium is now fi nished and ready to water. Use a long–necked watering can and train a gentle stream of water against the glass. Use very little water — just enough to clean the glass and moisten the surface. Keep terrarium in a spot with diffused light. If too much condensation forms, give the terrarium a little less light or remove the top for two hours.